Developing countries, whose economies often rely heavily on one or two agricultural products, are especially vulnerable to climate change. 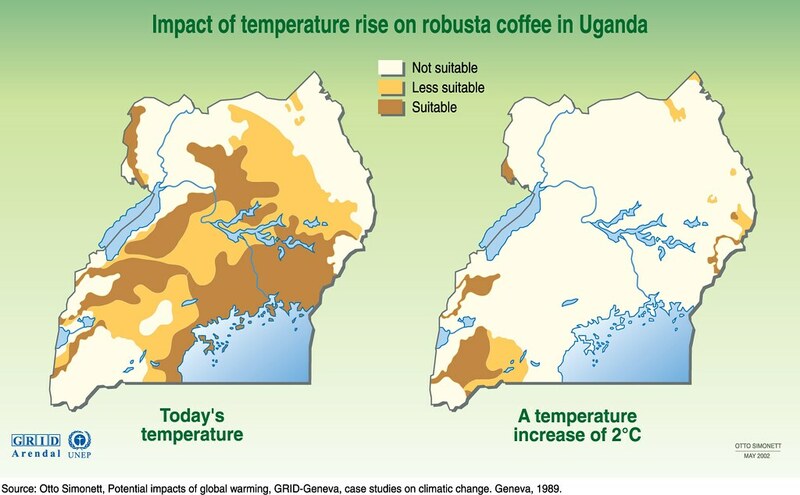 This graphic shows that with an increase of only 2 degrees Celsius, there would be a dramatic decrease in the amount of land suitable for growing Robusta coffee in Uganda. Emissions from human activities, and primarily fossil fuels, contribute to climate change, global warming and the greenhouse effect. This is primarily from industry, energy, transportation and related sectors. 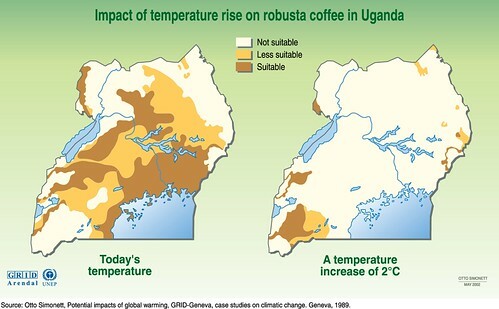 For any form of publication, please include the link to this page and give the creator credit (in this case Otto Simonett, UNEP/GRID-Arendal) If the high-resolution file is not available, please contact grid@grida.no for request and permission for usage.